Try These Easy Olive Oil Tips in Your Home! Olive oil is probably one of the most versatile things in your home and it offers the bonus of being all natural, non-toxic and something that most of us always have on-hand in the Kitchen! You’ll be amazed at how many problems you can solve (and how much money you can save!) with these simple tips. Do you have squeaky hinges on your doors or cabinets? You don’t need the WD-40. Just grab some olive oil from the pantry and apply it with a cotton ball! Olive oil also makes a great polish for stainless steel. Just rub it on like you would any other stainless cleaner and you’ll have streak-free results without all the chemicals! Have you ever measured out a tablespoon of honey for a recipe and then had to wait patiently while it drizzled into your cooking sloooooowwwly? Just pre-coat the measuring spoon or cup with olive oil and the honey will glide right out like magic. You can skip buying pumice soap for washing up after your dirtiest chores. All you need is a one-to-one mixture of olive oil and salt. Scrub your hands with this gritty, but moisturizing, mixture and things like car grease and house paint will come right off! If you’ve been extra un-lucky and got house paint in your hair, don’t panic because olive oil can help there, too. Soak up some olive oil in a cotton ball and rub it on the paint for a gentle quick fix. Saturating hair with olive oil for 10-15 minutes will also remove gum! No scissors needed, and a low cost oil treatment for your hair? I call that a win-win situation! 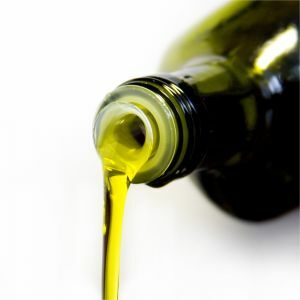 Olive oil is also fantastic for removing sticker residue from hard surfaces like metal and glass. Rub on the oil until the residue is gone and then give it a quick cleaning with a standard grease-cutting cleaner. Want a natural wood furniture polish that also cleans gently? Make a mixture of two parts olive oil and one part lemon juice or white vinegar, put them in a spray bottle and shake it up. This polish leaves no toxic chemicals in the air and no build-up on your furniture! New Jersey has had it’s share of power outages in the past couple of years thanks to all kinds of crazy storms. If you keep a stock of wicks for oil lamps, all you need is a jar and some olive oil to create an oil lamp the next time you’re left in the dark! Bonus Tip You Can Skip: Lots of articles suggest using olive oil as a leather polish for your shoes, bags and leather furniture. Experts say NOT to do this. It will temporarily soften leather, but it doesn’t really nourish it in the same way that a proper leather cleaner can. It will absorb temporarily, but may surface again in the future in the form of oil spots. It’s also not a cleaner, so the dirt that can shorten leather’s longevity will stay behind. Your leather goods are way too expensive to mistreat, so go ahead and buy a product made for this use!